While watching the sun go in and out all weekend, I finished planting all the seedlings that had to go out and amending the soil in the last few beds. Now let summer begin! Here is what is growing now. Bleeding heart (dicentra spectabilis) are always so beautiful now. As kids we called them lady-in-a-bath-tub. If you take a flower and turn it upside down and pull the sides of the pink "bath tub", you'll see why. This border bed was renovated two years ago and is coming along. Long overgrown with ferns and vinca it has been a tricky spot because of the shallow roots of the maples along the wall. It only gets 4 hours sun, but the catmint, lady's mantle, lamb's ears and hosta do fine. The white Rhododendrons that were great last year are looking a bit beaten from deer grazing (who could blame them this winter) and bitter winds. They might need some pruning later in the season. 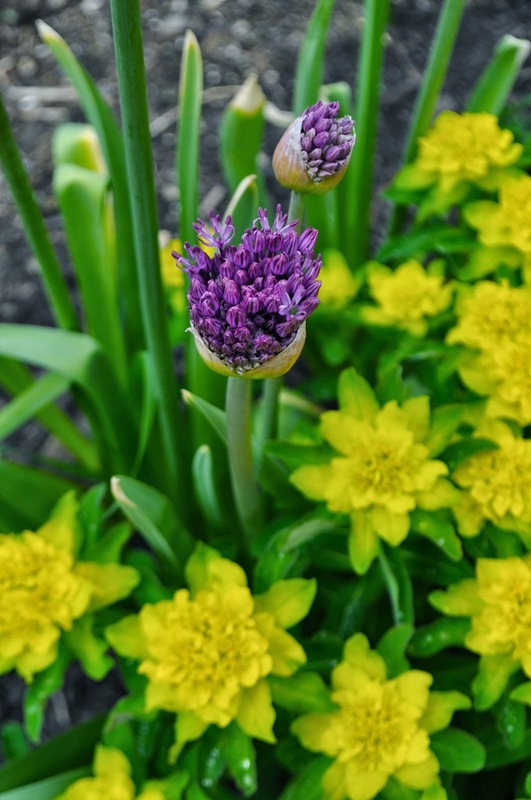 I like this combination of Allium with the Euphorbia polychroma. Love that purple and lemon together! Rhubarb is at it's height now, with stems still red and good enough to eat, while the flower heads are starting to rise. This clump was part of what we assumed was an old vegetable patch where we put in the Medieval Garden. We dug it out of the lawn and just threw it in a spot by the barn. I remember being so busy that summer I never got back to even covering the crowns under the soil, but see what neglect does! This year I have to remember to freeze enough for pies for the year. Bluets (Houstonia caerulea) are everywhere here, my favorite harbinger of spring. 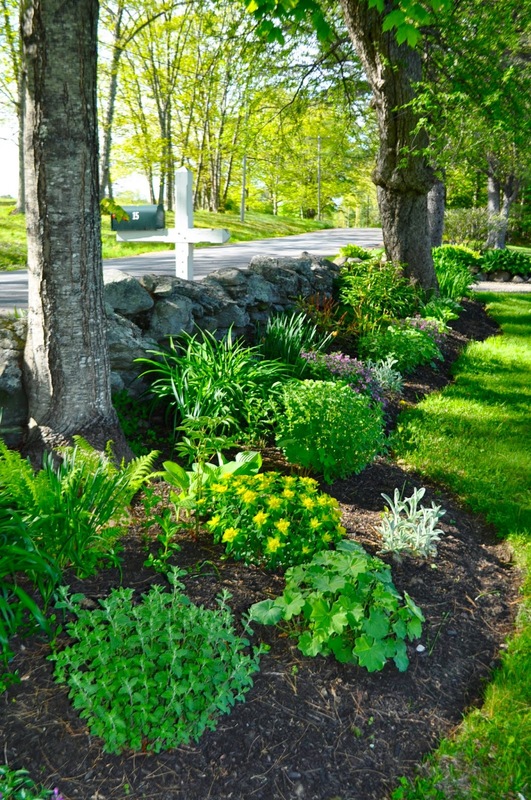 David mows around them for as long as they bloom each year, giving the yard a flowery mead look. 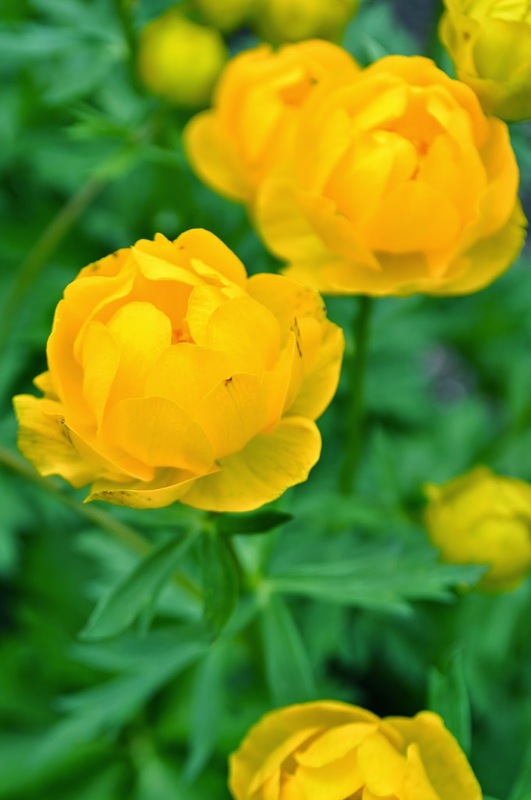 The Trollius Europaeus always is a stunner this time of year, but fades and then dies back later in the summer. I always have to remember where it is and be careful not to put a late summer purchase in it's spot! The herb garden is still coming to life. Things take awhile to get going down here. This garden has the most extreme conditions on the property with harsh cold all winter settling in the lower nooks, winds whipping across the fields and very wet soil. Suffice it to say I NEVER water this garden. 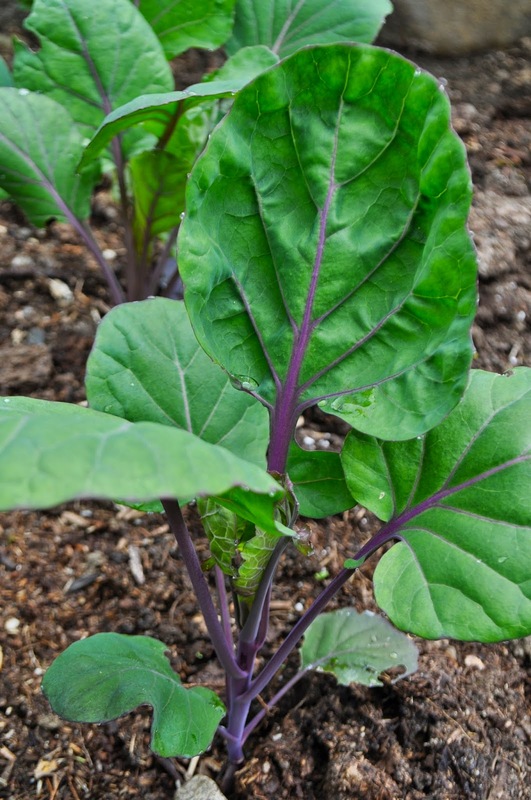 A new vegetable variety I am excited about this year is this Flastaff Purple Brussel Sprout. Already it is rewarding in it's vigorous habit and brilliant purple stems. Along with that I am trying a Cheddar and Romanesco cauliflower. For tomatoes I have kept it simple this year with only Sweet 100's and a heirloom French variety called Jaune Flamme from Seed Savers Exchange. I just never have good luck with all the great heirlooms you see in the Farmers Markets here in Freeport. It just isn't hot enough I think. This year I am just going with tried and true. What new vegetables are you trying this year?